Memory candles can be quite simple. Since custom made candles can be expensive, you may have wondered how do you make a memory candle yourself. The good news is that there are several ways you can make your own personalized memory candle that will look just as lovely as anything you could purchase. Memory candles are any sort of candles that are used to commemorate or remember a loved one, or even a cherished pet. Memory candles are commonly used during weddings, when family members or dear friends who have passed away are remembered. They can also be part of a candlelight vigil, prayer service, memorial or funeral service, or any other time you wish to honor a departed loved one. The most common color for a memory candle is white, but there are no rules to say that this must be the case. If you're creating a memorial candle for someone whose favorite color was purple, feel free to reflect that in the candle color. One simple way to make a memory candle is to transform a plain, purchased pillar candle, or one that you have made yourself. Choose a good quality candle to start off with, because you'll want the wax to melt slowly, and pool in the middle of the candle as it burns. Cheaper candles that use poor quality wax will cause the melting wax to run down the sides of the candle, marring the text, photograph, and/or embellishments. 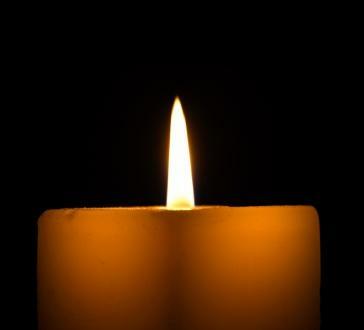 Wipe any dust or debris from the candle with a damp cloth, and allow to dry completely. Measure the circumference (distance around) the candle. Using vellum paper, print out your verse, poem, photograph, or any other printed material so that it will fit comfortably around the candle. You'll want any text to be readable without having to turn the candle around in your hand. Use fancy fonts or colors if you'd like to. Cut the paper print-outs to fit the candle if necessary. Place and adhere the paper to the candle using double-sided tape or thin glue. Add any decorative touches you'd like, such as ribbon, shells, or flowers, with glue. You can place these on simple pillar candle holders, creating a nice display with other items such as framed photographs and cut flowers. Because the paper and adornments are flammable, only light these candles for a short period of time. When you notice the flame starting to burn down towards your decoration, snuff the flame and preserve the memory candle. For a little added protection, dip the candles in plain white melted paraffin or soy wax after attaching the paper print outs, and allow to dry. The added layer of wax will obscure your text and photo only slightly, and will provide a better seal around the edges. Emergency candles are also called 7-day candles, and can be found at many grocery, hardware, or camping equipment stores. These tall candles are plain white, and held inside a clear glass holder. They're a little narrower than pillars, but the built-in holder makes them quite safe. Measure the outside of the emergency candle's holder, from just below the top rim to the bottom, and the distance around. Give yourself an extra half an inch overlap in the circumference. Once again, print out your photograph and/or prose. This time you can use any light paper that will allow the candle glow to be seen through it. Attach the printed image and verse to the candle using thin glue and allow to dry. Add ribbon or any other embellishments, if desired. These candles can be left burning for much longer than the pillars. Always keep an eye on any lit candle, however, just to be safe. For some ideas on what to write on your memory candles, visit Memorial-Keepsakes.com.